If your heart is telling you that you’d prefer a smaller scale outdoor living space, then by George, it’s time to stop,and listen. Very often we work with homeowners who want to go smaller rather than bigger when it comes to their outdoor living space. As the premier Austin-area outdoor living space builder, Archadeck of Austin fully supports your decision for the right sized space to fit your needs and budget! You are probably familiar with the old saying bigger is better, right? As Americans, we generally assume this old saying rings true — hence our affinity for bigger cars, houses and yes, super size fries. But the old saying of bigger is better is not the case for everyone. The reasoning behind building bigger outdoor living spaces is simple. It is because homeowners crave a transference of the comforts and function they have in their interior living space, outdoors. However, if the scale of the project is not in proportion with the home, or lot, it is being used on, or alongside, then it certainly doesn’t make sense — after all, it just wouldn’t make sense to build a 1200 foot deck onto a 1200 foot home! One of our most recent projects speaks to the concept of building to fit the scale of the home and needs of the client. 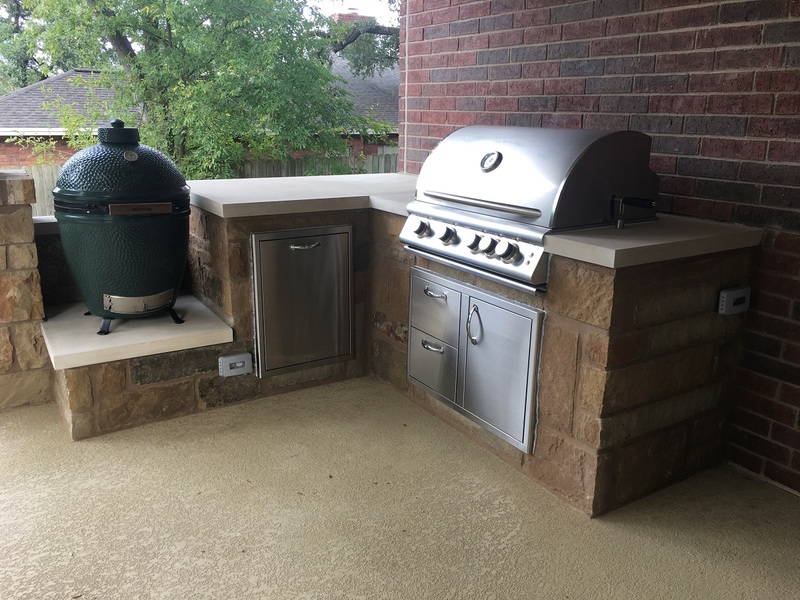 The project consists of a smart and simple outdoor kitchen addition in the Forest Creek neighborhood of Round Rock, TX. When the homeowners reached out to us, they knew exactly what they wanted — including the proportion and scale of the project. Simply put, they wanted a small outdoor kitchen addition that didn’t eat up (no pun intended) too much of their outdoor space. 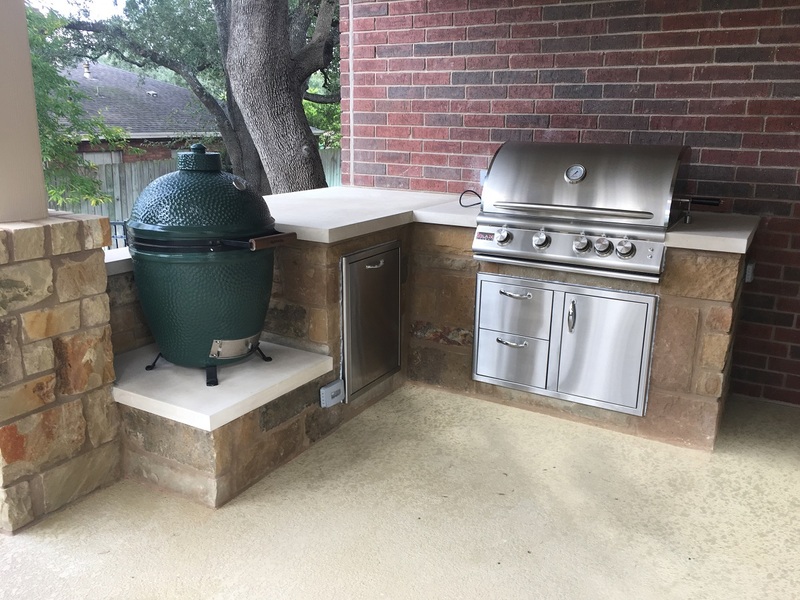 — Quaint and effective outdoor kitchen addition in Round Rock TX. 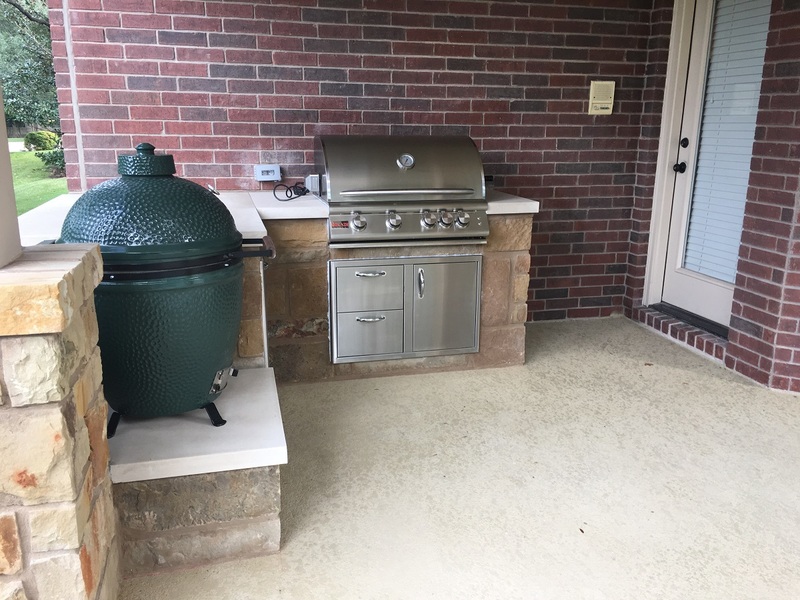 These homeowners had a great backyard and are avid Big Green EGG-er’s, so the area had to include a space designed to accommodate their beloved EGG. As a homeowner looking for a custom outdoor living design and build company, perusing our website photo galleries may make you feel like we only build BIG outdoor living spaces. As the economy has improved over the last few years, building projects have generally increased in size, scope, and level of specialization, including the introduction of many new amenities and materials. Decking, porch materials, hardscapes and electrical components are just a few of the areas that have all changed dramatically in the last decade. With this in mind, building a BIGGER outdoor structure is not always the best option for many homeowners. Outdoor living structures should compliment the scale and proportion of your home, lifestyle needs and budget. The homeowners are elated at how their new outdoor kitchen turned out! Archadeck of Austin pours the same level of expertise and level of specialization into every project we build — both large and small. Whether it is a small outdoor kitchen, paver patio or full-on outdoor living combination space, we will professionally design and build the outdoor living space you’ve always wanted. Call Archadeck of Austin today at 512-259-8282 or email us to schedule your free design consultation.